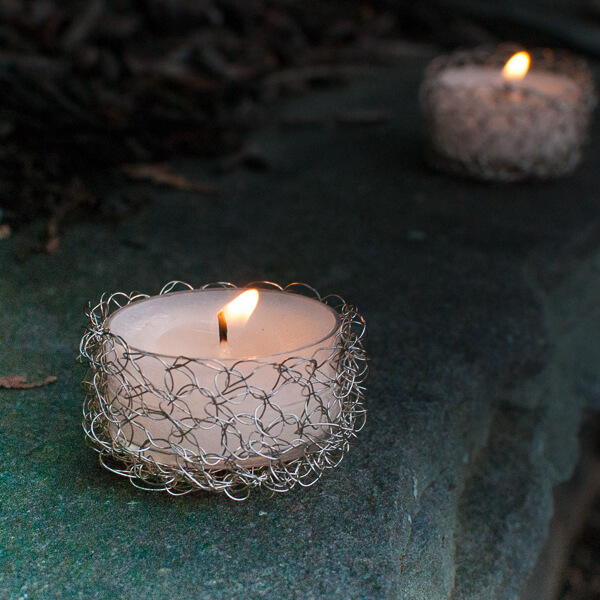 Work up a pretty wire crochet tealight holder to add ambiance to any setting … both outdoor or in! If you haven’t tried crocheting with wire yet, don’t be intimidated … it’s so much fun! And the result is a unique piece that will leave you wanting to make even more. 28 gauge silver wire, approx. 15 yds. Resources and tutorials you may find helpful in following this pattern: Crochet Abbreviations, U.S. to U.K. Crochet Conversion Chart, How to Make a Magic Ring. Make a magic ring, or alternately you can ch 2 and then work Round 1 in the second ch from your hook. Rounds 4 through 7: Ch 1, work 1 sc in same st as join and each st around, join — 18 sts. 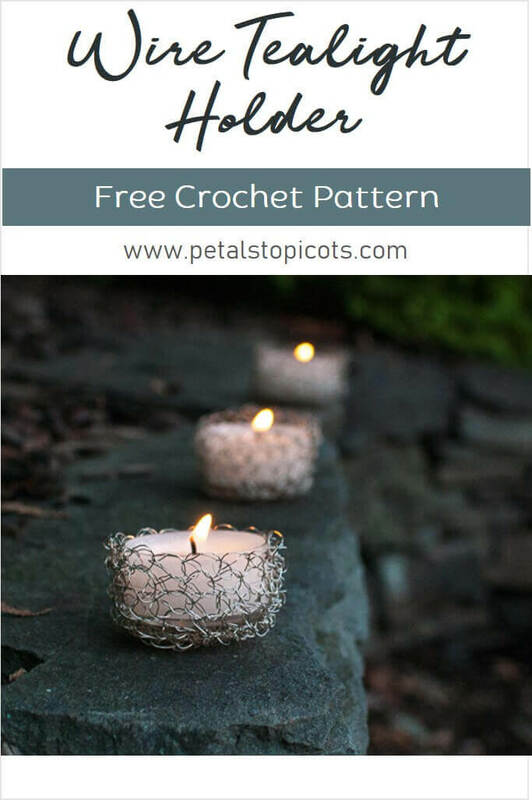 Now just fill with you favorite tealight, grab a cup of tea, and relax. These are beautiful, so I thought I would give them a try. Wire is so hard to work with, do you have any hints? How many yards of wire would you say each one is? I’d love to try it in color wire but the packages are 5yds per so want it to be enough! Hi Jess 🙂 unfortunately I did not measure the exact amount for each one, but it didn’t take much wire at all. I tried this because I really liked it but I just couldn’t make it look as pretty as yours. Is there any secret to working with wire? Hi Yvonne 🙂 There really isn’t a secret, but the wire can be a little tricky to work with. The nice thing is that you can try to reshape your piece manually with your hands too. These are simply stunning, Kara! I think you’ve opened up a whole new world of crocheting with this project! Pinned. 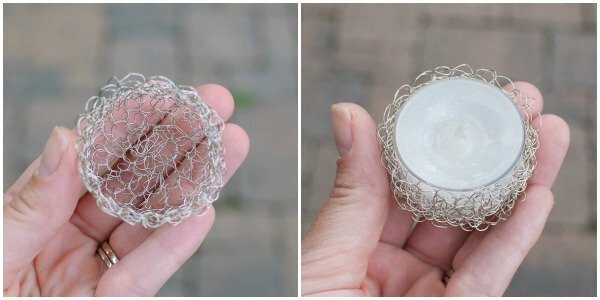 This looks like a good beginner’s project for working with wire. Must try this. Thanks! Kara, thanks for the pattern. I’m a big fan of your blog. 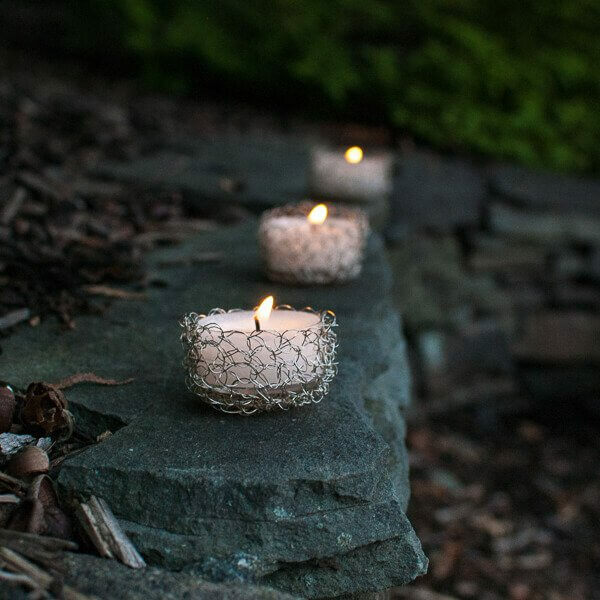 However…these look like tealights, not votives. Votives would melt all over and you would need a glass or plastic insert in the wire to prevent that from happening. Tealights come with their own little plastic cup and don’t make a big mess. Great way to dress them up!